Downtown Edmonton is seeing a significant transformation with the development of the ICE District. The complete redevelopment includes premium residential, retail, public and office spaces in one location. 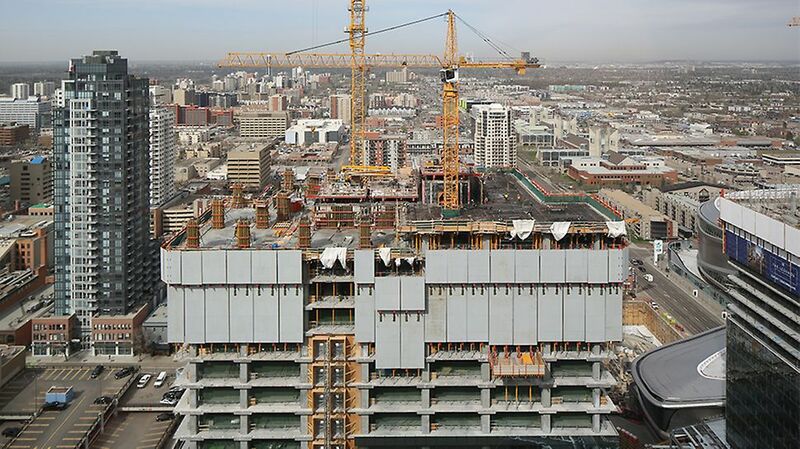 The skyline is dramatically changing as large scale projects continue to rise, including the 66-storey Stantec Tower. 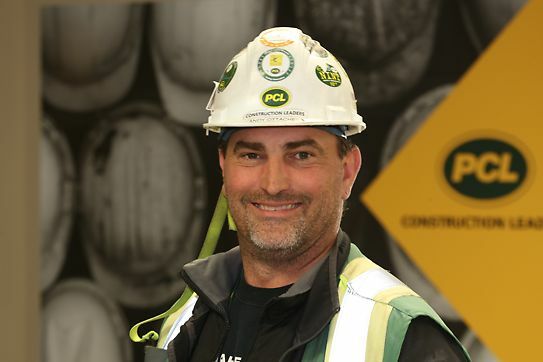 PERI has been involved with the project from the beginning, working together with PCL and Newway to provide professional engineering solutions and logistical support. A wide range of PERI products have been successfully utilized on this project, including TRIO, VARIO GT24, SKYDECK, SKYTABLE, PERI UP, and MULTIPROP, each providing its own benefit to the project. For safety, the upper working floors of the building’s perimeter were enclosed using RCS folding protection panels. The building’s core featured PERI’s brand new self-climbing ACS Core 400 system. I am impressed with the quality of the equipment and the detailed assembly drawings. Also with the ACS Core 400 system we can achieve high productivity rates. "The assembly of PERI equipment is very easy and fast. The climbing procedure of the ACS Core 400 is not complicated. This allows us to advance to the next level quickly to keep our cycle time low." 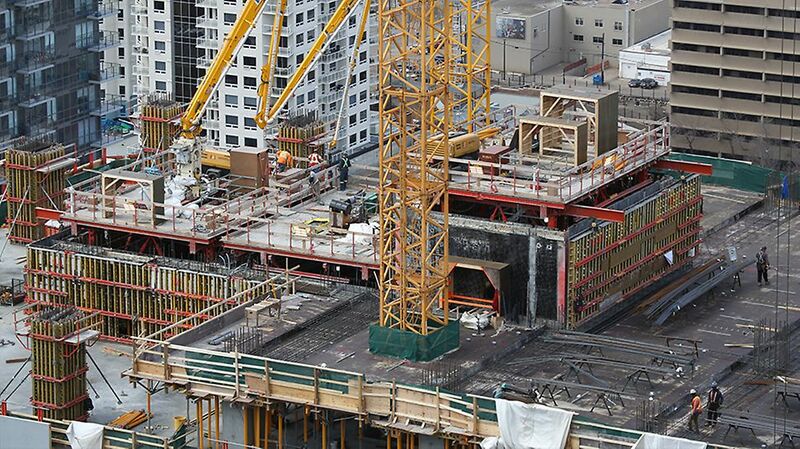 Once above grade construction of the tower began, office and residential level slabs were formed using SKYTABLES. A number of different sized tables were designed to fit around the various columns and shear walls. The flexibility of the system allows wider tables to be used in the larger bay areas; wider SKYTABLES are created by using three trusses instead of the typical two. The Lifting Mechanism STM, with its 6 tonne lifting capacity, allowed the tables to be safely moved with a single crane lift, optimizing the usage of the crane for other work and shortening formwork cycle times. As the structure increased in height, additional forming challenges needed to be addressed. Level 30 includes a 2.0 m thick transfer slab and 1.0 m deep beams, with a floor-to-floor elevation difference of over 7.0 m. The MULTIPROP system, using high load capacity MPB Aluminum Beams, was used to form the transfer slab. Areas with 400 mm thick slabs were able to use the SKYTABLES from the levels below. As a result of the higher shoring, SKYTABLES were increased in height by adding additional MULTIPROPS which were stabilized using MRK Brace Frames. Safety, for both site personnel and pedestrian traffic around the building, was the number one priority during construction. The RCS edge protection system was used to avoid the risk of falling debris while at the same time protecting workers from adverse weather conditions. 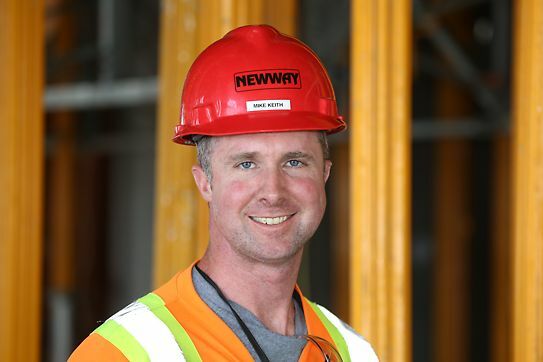 With fewer lost days due to inclement weather and higher productivity rates created by the feeling of safety, the tight construction schedule was maintained. The RCS-P self-climbing system utilizes standard PERI components to provide a complete enclosure that can be easily adapted to any building geometry. The system extends to an elevation that is 2.2 m above the concreting level and also provides edge protection for the three working levels below. The RCS units are connected to the building at all times at 4 points by means of lightweight slab and climbing shoes attached to anchors set in the slabs. Using mobile hydraulic equipment, each unit can be quickly climbed without the use of the crane to the next level while always being safely secured to the building. In order to be able to fly SKYTABLE units out of the building from within the RCS enclosure, RCS-P Fold Down units were used. These units are capable of opening and closing using integrated hydraulics to give clear access to the working level for cycling table forms. RCS Outrigger platforms were attached to the bottom of specific RCS units to provide a heavy duty material storage and landing platform on the two trailing levels. To provide safe access between the upper levels of the building, a 16m tall PERI UP staircase, enclosed with debris mesh, was mounted to one of the external RCS units. In order to maintain a tight schedule with limited crane availability, the massive elevator and stair core at the center of the building utilized PERI’s new ACS Core 400 system, designed specifically for large cores in high-rise structures. 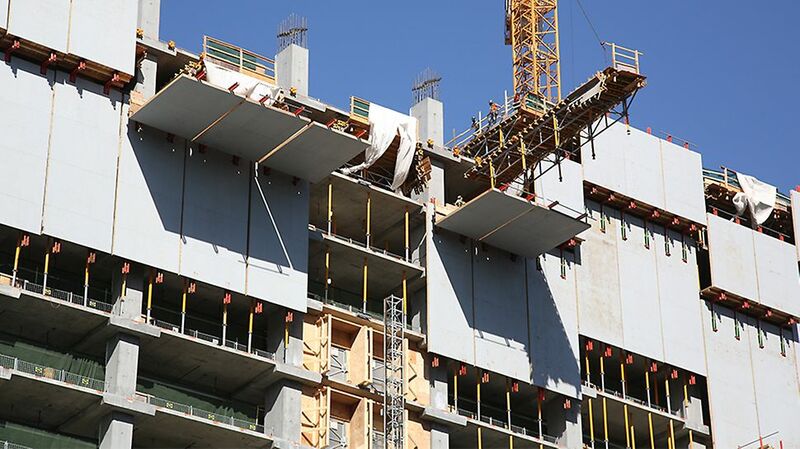 Used in combination with VARIO GT24 wall formwork, the C400 climbing system achieves the fastest cycle time possible for large cores, with the least amount of labour. 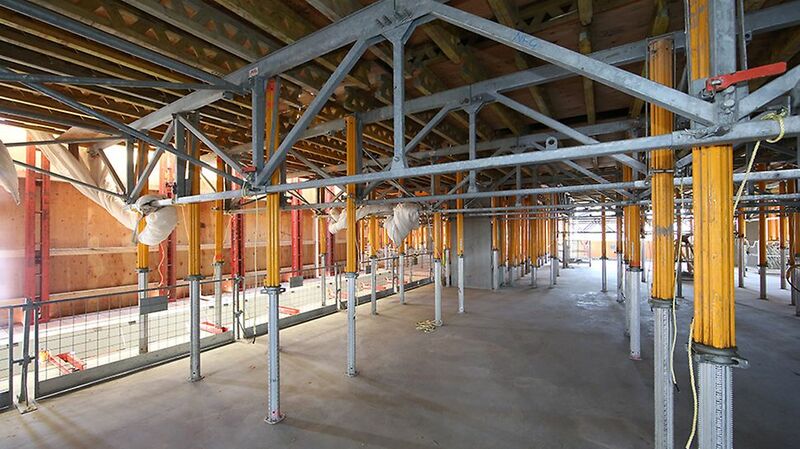 The ACS Core 400 system climbs independently of the crane, using 5.1 m long cylinders that lift the core’s complete formwork and working platforms to the next level in one stroke. With a climbing capacity of 400 kN (40 tons) per hydraulic cylinder, extremely large cores are climbed using just 4 cylinders. Large concrete placing booms mounted to the upper steel beam grid are both climbed and supported during operation without the need of additional bracing frames or long mast segments. As the system climbs, the working and trailing platforms use the same anchors, cutting the labour and the amount of consumed material in half, which results in significant cost savings. The exterior forms associated with the C400 system roll back on overhead gallows, retracting away from the concrete prior to climbing the system to the next level. The internal forms are struck using wedge striking elements which quickly shrink the core by 40 mm before climbing. The system uses patented pump technology, which monitors the oil flow to all cylinders and triggers them to ensure simultaneous climbing, even under deviating loads. This allows for a smooth and straight climb without the guidance of climbing rails. 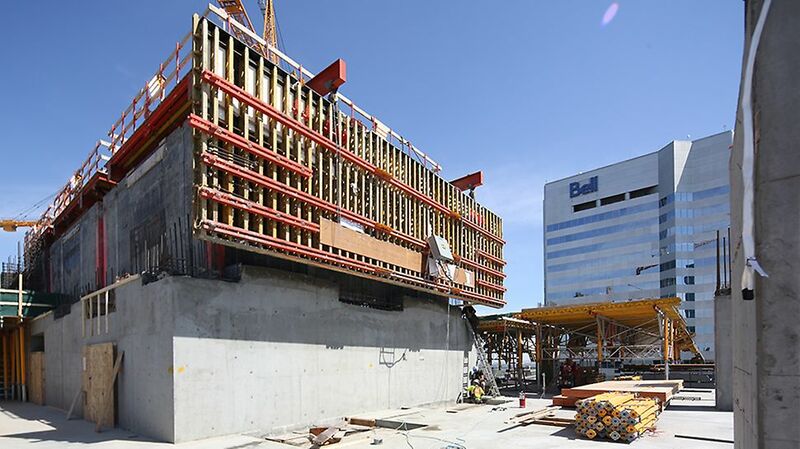 While not used on this project, the ACS Core 400 can include hydraulic stripping elements which allow for fast and quiet, striking and setting of the interior core formwork in under 2 minutes with the press of a single button.